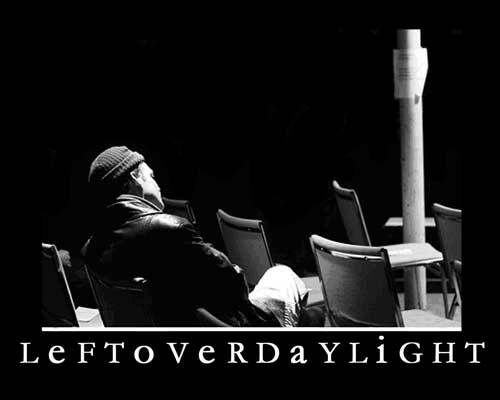 The Leftover Daylight series began as a bi-weekly event in November 2003. Ken Aldcroft and Joe Sorbara ran the series together through the end of December 2005 when Nick Fraser came on board to help present a weekly series. At that point pianist Marilyn Lerner became the first monthly 'guest curator' - an idea introduced in order to make sure that as many creative musicians as possible were being included in the series. Curators came and went over the years. In addition to those mentioned above, they have included Colin Anthony, Geordie Haley, Colin Fisher, Rob Piilonen, Nicole Rampersaud, Heather Saumer, and Mark Segger. The final Leftover Daylight event at the Arraymusic Studio took place on November 28, 2008 and the music began again two weeks later at the original Somewhere There location in Parkdale. Somewhere There itself moved to a second location on Sterling Road in August 2010 and the series went with it. When Somewhere There was forced to close its doors due to the effects of gentrification in January 2013, the Leftover Daylight Series came to a close as well.